A very nice one as all Runoffgroove designs. Very useful and flexible. I love it before or after a fuzz or an overdrives. Acts like a versatile booster or like a post pedal EQ. Never used it to get a specific tonestack behavior, though. May I know that if it could be used as a clean preamp pedal in my chain? definitely can. A very nice preamp with a lot of options. Haha! Thanks a lot Miro!!! !Happy holidays to you too! Miro! i've checked the schematic and noticed that the 1M resistor to the left of the ic should be 1 row down, to the 3rd pin of the ic, also, the right 100uf cap should get 9v, and it's going to treble 3! Thanks. I'll check/fix it once i get home from work. You were correct. Now fixed. Did you built it? Has anyone verified this? I'm about to put two of these into one box soon! I might lay my hands on this one tomorrow night if you havent already. Thinking of stacking this with either the TC preamp booster and/or the mid booster that were up here earlier. Tag it, i´ve built it and it's just awesome. It has a great contol to make you go anywere you want with your standard setup. Thanks! I'm having some weird problems but I'm just gonna have a better look at the whole thing. Haha my silly little problem was that I was using the first layout, as in before you corrected it. I had it saved in my iPad and then I realised that you had fixed it so I quickly swapped a few components around and it worked perfectly! I gotta say, this thing sounds so good! It's almost as if you can transform your amp (or tone rather) into two totally different amps. Hi can you help me my circuit has lot of noise specially in treble pot if i move my hand on it it make noice. Your one is very silent. I am using ROG layout provided on official web not this stripboard layout. Can anyone tell me which specific frequencies this thing controls? Especially the bass control? What's up with the demo of this one? Is there two of those circuits that are identical in that box or what? Ok, thank you. I've fixed mine and now it works! I can still see a minor error on your 1st-fixed layout..... According to ROG schematic the positive lug of the 2nd 100uF electrolitic cap should connect to the third row the same column, ain't it? On your fixed version of the original layout on the bare board cuts and links part of the image the right hand link and the cut next to it is 1 hole to the right compared to the top part image. I only noticed it when i was populating the board (i work left to right). Thanks for the pic! Amazing work! Both are verified, so there could be a short or some other error on your build. What voltages are you getting at the IC pins? You could play around with values of the lower 22n and that 47n. Did you use all the correct values of components (or at least close)? I've built a few of these and the bass knob as always worked very well. It adds heaps of bass when turned up. sid you use the first or the second layout? I used the first one. Didn't even know of the second one. is the second layout verified? Not sure... It's fairly low part count, so you could try it out. I'm pretty confident about it. No prob, ill give it a go one of these days. Any idea if I could replace the level control with a resistor to get unity gain? Im also guessing that i could ignore the switch if i want to just get the High setting? Anyone else have noise issues with the circuit? Listening to Geiri's demo, there is no noise issues.. hmmm..
im at a lost here lol. I've just built and been trying to debug the smaller vero layout. I was getting clicking or oscilliation whenever I turned any of the pots up, but it would only happen if I hit the strings slightly harder than *soft*. I re-wired the pots and that seemed to help, but I was also getting a lot of distortion, like flat out tubescreamer distortion. I pulled the TLO74 out that I had in there and replaced it with a 4558D I had lying around for s**ts and giggles, and that seems to have gotten rid of the clicking, but I still have loads of distortion. Did you ever find a R value to replace the Level pot and just have unity-level output? I'd like to put this in another box before that effect. Would this work with bass guitar? TREBLE is giving a shrill whistle when open ..... what to do? Built this today and i´m very impressed by the flexibility of this little sucker;-). I used a 500KA as treble pot, to my ears the taper is much smoother than the 500KB.... Anybody tried different op-amps? I put in a 5532, any experience with others....? hi, can you add this circuit in a random pedal in tha same way as you do with the bmp tonestack? Don't see no reason why not. hi all ! actually this is my first build. I want to know if i need an isolated dc power jack and isolated jack 6.3 for this. You need an isolated dc jack, but you dont need an isolated input or output jack. Any1 can tell me if i can use this as a guitar->pedal->power amp? the power amp has no preamp in it, or i have to put something in between to increase the signal so my amp can read it properly. Thanks. Was the more compact layout ever verified? I'm getting noise issues as well (tone pots seem to function though) and I can't seem to make sense of the 2 different layouts by comparison. If it wasn't it is now. Just finished building one for myself. No issues. Fired up in the frist try without any noise. Without being boxed, it does squeel with all the controls maxed. But that also means that it is loud as F.
Thanks. Sorry, I tried to leave a follow-up comment last night (and another this morning), but for some reason I can't seem to reply to comments (the page just refreshes after I hit publish, but my comment isn't there). Anyway, I had a sneaking suspicion the noise was coming from this circuit being unshielded in my test rig. I put it in a temporary enclosure and now the noise is gone. Works great. I'm hoping to use it as the preamp/EQ in front of a cab sim circult (based on the JMP1). They sound great together! You could try to drop cookies from google, that could solve the comment problem. I think i'm throwing the old layout out, as the revision is way better... Good to hear you got it sorted! Do you think this would be a good eq for an acoustic guitar? Anyone build this for an acoustic guitar? Built this one a couple weeks ago. Goes great with an orange tiny terror. While I love my tiny terror I wanted more EQ options. This fit the bill perfect and is a pretty simple build (this coming from someone who has only built about 10 pedals at this point). Hi everyone! I have found in the TSC software from Duncan Munro that "the Vox stack can be viewed as a Fender stack with a fixed mid control"; Rungroove has written that we must select the "Marshall Tone" and fix the middle to reach the "Vox Tone"...the reverse! so... who is wrong, who is right in this story? If one of you has an explaination, it would be great! They are all pretty similar but IMO, the Vox AC30 tonestack is still a little closer to that of a Marshall. 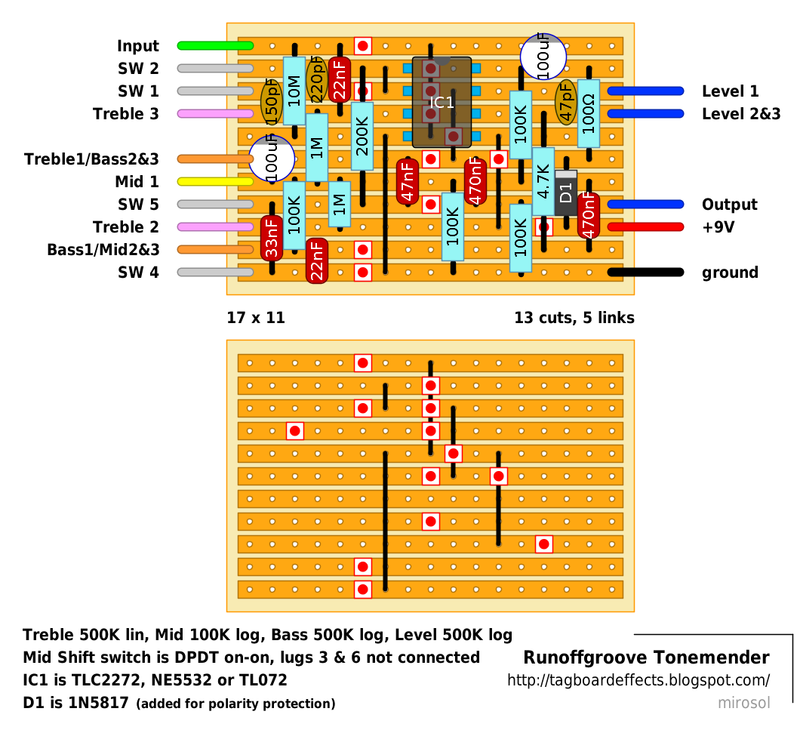 BTW, even if RunOffGroove suggested that to get a Vox tone you have to use the Marshall setting it doesn't necessarily mean the "reverse" of anything. trying this out with a 1n5818 and i will be running it off 26 volts to a tpa3116 mono 100 w class d amp board . using 50 volt caps and the ne5532 op amp in a very small "pray it fits" chassis . so i used 50 volt electro caps and sure enough the circuit runs fine at 26 volts . paired with the class d amp board (tpa316) in a little pc printer switch box painted black with a top handle . its a nice cheap little amp . i was jaw dop amazed at how loud it ran off 9 volts . attn noisy cricket lm386b crew . . . the amp board was 5.40 cents shipped so . . . if you insist on actually building something , add the tonemender to your mini amp project and you will have a real winner ( vs the turd you woud end up with any lm386 based amp . . . sorry but its true . at least go with a 7052 chip and make a punch amp . Nice one! Works great with tl072 - no hum nor noise. Someone can explain me how I can do that? I want a gain pot, it is an excellent mod. I had loads of trouble with this. Boxed it with a BAT superlead revelation, a wah and a red rooster and got loads of high pitched whistling, then gating, then nothing. Then I gave up and boxed it with a switchable dod grey spec before it and its excellent. I usually play very heavy doomy rock but since I’ve made this I can’t stop blues noodling with the mid shift switch in the fendery position. An absolute joy. I found my error - inserted the IC the wrong way ... lug numbering is correct that way. Yes, I noticed that, too. He have a lot of volume. Is this what you mean? Clean but loud? I didn't tried it yet, but in this case I guess you can increase the 4.7k resistor. But I don't know if this will change some frequency, maybe you should change even 470nF cap on the right. Or, a 250k pot could cut some volume. These are just some suppositions. Let us to know if you solve it somehow. Can I turn it on "amplifier return"? would be too low? does it work with 18v? My pcb has problem my bass and mid controls dont work only treble knob works. i am using all liner pots.